Memphis is the 11th most dangerous city in the country for pedestrians, according to a report released Wednesday. Produced by Smart Growth America and the National Complete Street Coalition, the report called Dangerous by Design ranks states and big cities using a Pedestrian Danger Index (PDI). The PDI measures how deadly it is for people to walk in a certain place based on the number of people struck and killed by drivers while walking. The number of people living in an area and the number of people who walk to work there are used to calculate the PDI. Data from the Fatality Analysis Reporting System used for the report dates from 2008 to 2017. Tennessee comes in at the 12th most dangerous state for pedestrians, but Memphis is the state’s only city to make the list of cities. With 297 pedestrian deaths between 2008 and 2017, Memphis’ PDI is 184, up about 31 points from the number reported in the 2016 Dangerous by Design. Other cities on the list include Jackson, Mississippi at number 10, North Little Rock in 19th place, and Orlando, which comes in at the most dangerous city for pedestrians in the United States and has a PDI of 313. The report shows that the majority of the most dangerous cities for pedestrians are in the South, concentrated in Florida. Cities on the list outside the South include Detroit, Albuquerque, and Bakersfield. Across the country, drivers struck and killed a total of 49,340 pedestrians between 2008 and 2017, which is the equivalent of a large jet of people crashing and dying every single month during the nine-year period, according to the report. Of the nearly 50,000 pedestrians who were killed nationwide between 2008 and 2017, the report cites that older adults, people of color, and people in low-income communities represent a disproportionate number. It is almost twice as dangerous for people over 75 years old than it is for the general population to walk, the report says. While, people of color, specifically American-Indian and African-American pedestrians, have a PDI of 33 and 18.3 respectively, compared to the general population with a PDI of just under 15. Finally, analyzing where pedestrian fatalities occur relative to the median household income of the surrounding area, the report found that people die while walking at much higher rates in lower-income communities compared to higher-income ones. 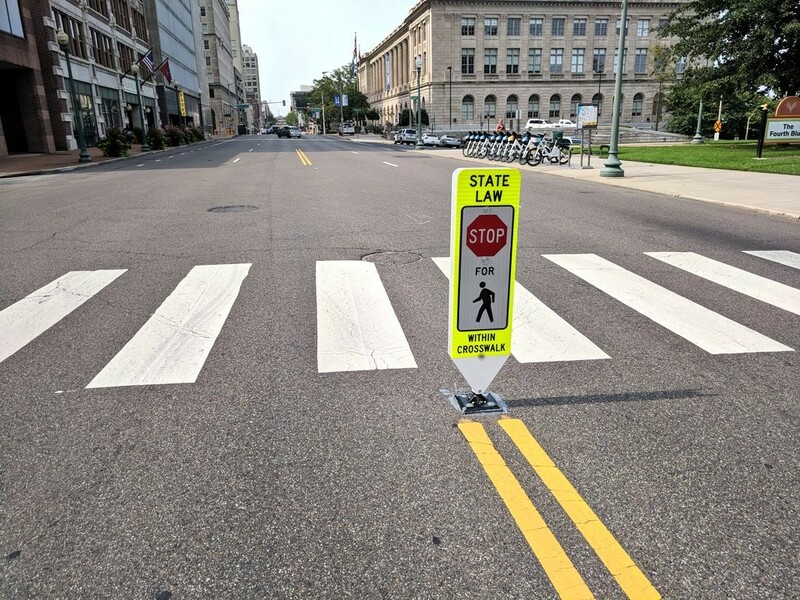 “This is unsurprising, given that low-income communities are significantly less likely than higher income communities to have sidewalks, marked crosswalks, and street design to support safer, slower speeds, also known as traffic calming,” the report says. Since 2009, pedestrian deaths have risen steadily. Meanwhile, traffic fatalities for those in cars decreased during those years. The report concludes that people aren’t walking more, but people are driving slightly — or 8.1 percent — more than in 2008. The report suggests that instead of allowing streets that are dangerous for pedestrians to continue to be built that the federal government should prioritize creating safer streets by implementing performance measures, producing more high-quality data on street conditions where fatalities occur, and dedicating more funding to projects that support walking, biking, transit, and other modes of transportation. “This year, Congress has a major opportunity to reshape our mobility future as they begin the work of reauthorizing our federal transportation bill in 2020,” the report reads. “To address our continuing safety problems, they must create policies that change the way we fund, design, and measure the success of our streets nationwide to make sure the safety of all people who use the street including people walking, is our highest priority.